There’s nothing like a good Twitter fight to spice up your social media newsfeeds (only when it doesn’t involve us, of course). Luckily for us, Tinseltown is flooding the Twitterverse with feuds on the daily−most of which exceed the 140-character limit. While 2013 isn’t over yet, there have been some pretty amusing Twitter wars with some of Hollywood’s favorites. Oh, and trust me when I tell you there will be plenty more to come. About a month ago when Miley Cyrus was part of an explosive Twitter war with musician Sinead O’Connor. Clearly Miley comparing her “Wrecking Ball” music video to O’Connor’s “Nothing Compares 2 U” video was viewed as more of an insult instead of a compliment. A few “save yourself” open letters and a few “I don’t give a %#@$” responses later and this feud is a thing of the past. 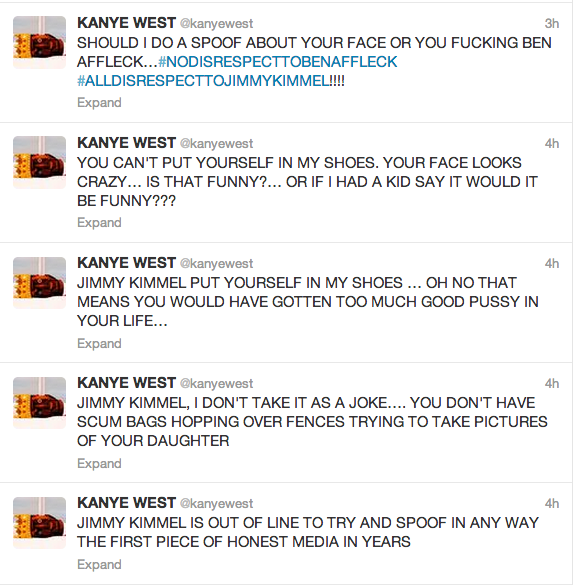 After spoofing a Kanye West interview on his show, Jimmy Kimmel received eight all-caps tweets from an enraged Yezzy himself. Kanye threw out some below the belt jabs and Kimmel responded with witty one-liners. I mean really though, would we expect anything else? To tie up loose ends, Kanye appeared as a guest on his show, the men hugged it out, the feud was brushed under the rug and all became right in the world again. These two women have been in not one but TWO feuds within the last year. The first stemming from body image comments about the Mother Monster and made on Osbourne’s popular show Fashion Police. Fast forward ten months and the girls are at it again. This time it is over a cake. Yes, a cake! Just last week, Osbourne posted a picture on Instagram of a belated birthday cake sent from Gaga. The caption of the unedited photo read “#EatMyS**t #Hypocrisy.” As Marie Antoinette would say, “let them eat cake!” No but really, just eat the cake and move on. Maroon 5’s frontman and Mother Monster had a go at it when Adam subtweeted the singer about her music being recycled from a previous generation (aka Madonna). Then somewhere down the line Adam was called the “art police” and Gaga was told she needed the “grammar police” yada-yada-yada. Let’s hope Lady Gaga isn’t making feuding in the Twittersphere a habit. A true battle of the bands. The feud began with direct tweets between One Direction’s Louis Tomlinson and The Wanted’s Thomas Parker about auditioning on XFactor. Insults were said, music was questioned and other bandmates and girlfriends were involved. Not to mention poor Lindsay Lohan was thrown into the mix. Girl just can’t catch a break. And based off of recent interviews this is a feud that is still going strong with no end in near sight. When up-and-comer Lorde threw shade on Selena Gomez and Taylor Swift, good friend Joe Jonas tweeted "Hey @lordemusic you say call me Queen B but you shouldn't be attacking all the true Queen B-tches's #respect." And they say chivalry is dead. Robert Kardashian not only mastered the art of subtweeting, he managed to perform a one-side feud after blasting his ex, Rita Ora, to his four million plus followers. In his defense he was tweeting with a broken heart−cue John Mayer song. No list of famous twitter wars would be complete without mentioning the ongoing feud between Brandi Glanville and Leann Rimes We get it, Leann stole Brandi’s husband, but for the same of all of our news feeds, this one just needs to end. Next Post: What is EDM to College Students?